Money has no value without the bloodshed of men. Chinese pioneering solar farm throwing down the gauntlet to the rest of the world. Last century, it was airline pilots that were the world’s game-changers and who made the girls go GaGa. Today, it’s green energy pioneers that are now changing the world and making the girls smile. We’re now humanity’s navigators that pilots used to be. How cool would it be if the next generation of EV (electric vehicles) had PV (photovoltaic) cells incorporated into the roof, bringing a whole new meaning to the words ‘sun roof’ – I digress. To demonstrate how game-changing PV solar panels (photovoltaic) with battery storage is, if you’d ask anyone from the 20th-century to describe the benefits of thermodynamics, they would have looked puzzled. Take them into an air-conditioned room, and the full majesty of it would be obvious. That’s the real difference between the solar savvy and the still yet to be initiated. Until you enjoy the benefits yourself, then it’s difficult to truly comprehend the self-respect and pride that comes with beating the current energy system. Men are waking up to the socially encouraged game of ‘monkey branching’ from one energy provider to the next without any benefit at the end of it all; the game is up for dirty fuels! Astute and savvy men today are looking at alternative options for long-term energy use, especially with the calamity of Brexit still to unfold with its ‘gift of regrets’ and ‘unfulfilled promises’. Great Britain! Truly, a world beater at ripping off its own citizens. And, they’re planning to sell this bounty with their desperate post-Brexit trade deals. Happy days! 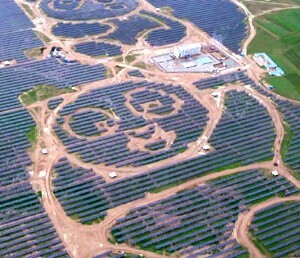 In contrast, Chinese solar engineers are mocking us with their provocative panda solar farm art. Great British men of solar, the gauntlet has been firmly laid. Angel of the North in solar panels perhaps. We solar savvy men are on the right side of history and infused with passion for squeezing even more juice out of our green technologies, as did the pioneering motor vehicle enthusiasts of the early 1900s. People whose names are now embellished and adorn every motor vehicle in the world today. Men built this civilisation, every road, every office, every home and defended freedom with their blood. It’s now the hunky men and chivalrous men of the UK solar industry now taking up the challenge to save Great Britain from ‘consuming’ it’s self. Men have invented almost everything except the push-up bra. Every bolt, every component that makes up the modern world was imagined, CAD designed and manufactured by men unselfishly providing for their families. And of course, it will be today’s pioneering ‘green’ technologists that will be remembered one hundred years from now as Tesla EV’s and Battery Storage are now honouring. His thankless, but extraordinary contributions and breakthroughs during his own time are still reverberating in today’s world. Today’s men of oil will fade to black. As the uncertainty of today’s traditional energy continues, PV solar panels can pay for themselves in several short years, leaving homeowners with decades of free electricity and mileage. Real foresighted men are looking at the long view, preparing and walking away from the Switch ‘N’ Save illusion that is the energy market today. How many times do you have to hear that energy prices are going up before you finally consider an alternative? Do you trust the latest crop of politicians to do the right thing were heating and powering your energy-hungry lifestyle? And more importantly, the British energy industry that your family depends upon is mostly foreign-owned and susceptible to post-Brexit political wrangling. Did I mention that we’re still on the safe side of Brexit! The brutal truth is that men (rich or poor) are viewed as disposable, so reassessing your homes energy strategy by installing solar panels will reaffirm your alpha-male astuteness with the lady in your life. We’ve historically been here before when the first motor cars began to become a familiar sight; there were still people declaring their allegiance to the tradition of the horse and cart. Today, alternative lifestyle technologies such as PV and EV’s are reaching a tipping point too, coincidentally, just as the fossil fuel industry has ‘peaked’ with the easy-to-extract stuff. There will always be men who can’t see further than their next payday, or next quarter’s profit and loss sheet, but we here are different. We are men going our own energy way. It will be solar panel technology pioneers whom will reshape this civilisation for the benefit of all, especially womankind. I have challenged our fair weather lady friends to use their ‘special skills’ to compliment their men folks green energy efforts. Come-on ladies, the solar-heated water feels lovely. We’ve entered a new paradigm with EV and PV technologies at the cutting edge; where air-travel used to be. Savvy men adopt alternative energy for their families because being wholly reliant on strangers for life’s essentials is just plain crazy in today’s world. True freedom only comes by realising that both sides of every conflict throughout the 20th Century were funded by US interests to justify its gargantuan military machine while spreading the influence of the Rothchild’s banking cartel across the world. North Korea is one of the last countries to be under such influence, as was Iraq and Libya before them. How much power do solar panels generate? How long do PV solar panels last?